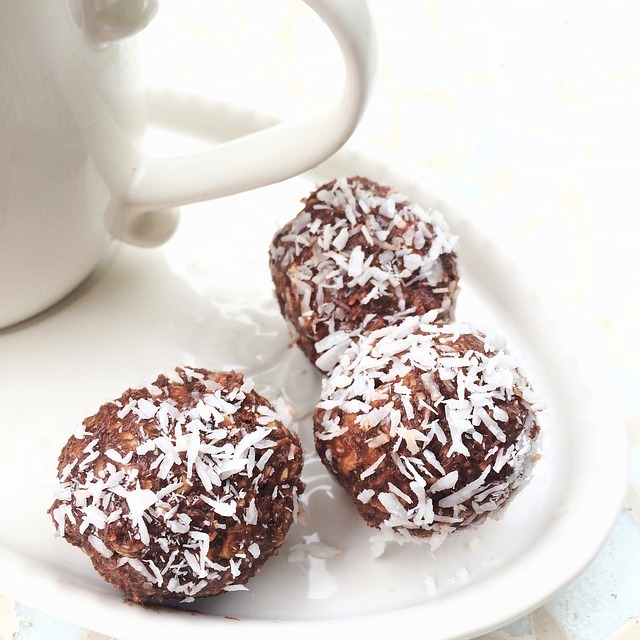 Easily digested carbohydrates, magnesium, calcium and B vitamins make these chocolate balls a great post-exercise snack or guilt-free pick-me up. The texture and taste is very similar to traditional Swedish chocolate balls, but without the added fat or refined sugar. One thing I really love about this recipe is how versatile it is. You can change the ingredients to make them sweeter, more filling or more nutritious. Roll the balls in pearl sugar to make them sweeter, replace some of the oats with crushed nuts to make them more filling or add powdered superfoods, such as spirulina to make them more nutritious. For protein bars, add 45g of 85% protein powder (whey, soy or egg) and 50ml rooibos tea (or water) to the recipe. This will give you a carbohydrate to protein ratio of 3:1, which is ideal for post-training recovery. Mash or knead the dates into a dough. This step will be easier if the dates are at room temperature. Add the dry ingredients and work them into the date dough. Pour some grated coconut onto a flat plate. Take around a tablespoon of dough and roll it into a ball. Roll the ball in the coconut and place in a clean, dry bowl or container. Repeat until you have used up all the dough. Place the balls in the refrigerater for at least 1 hour before serving. This allows them to develop a firmer texture.